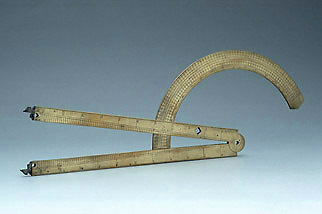 This instrument closely resembles the pattern of sector first publicised by Thomas Hood in his 1598 book on The Making and Use of the Geometricall Instrument, called a Sector. It can be used for the graphical solution of problems of proportion and, when fitted with sights, serves as a measuring instrument for surveying and other tasks of practical geometry. Angles between the two limbs are measured by scales on the circular arc, which also carries an incomplete table of gunnery information.